Last month, I had the pleasure of attending the largest ever ILTACON, the annual meeting of the International Legal Technology Association. While many noteworthy topics were discussed as the creative juices flowed among the best and brightest of the legal IT world, below are the top five buzzworthy themes that stood out after attending (and tweeting about) dozens of sessions. 1. INNOVATION is no longer optional. Innovation (and its roadblocks) was the overarching theme from ILTACON18. Among the primary questions rounding the discussion tables were: What are the greatest obstacles to innovation and change in the legal industry? Is it the billable hour? The regulatory roadblocks? On day one of ILTACON, the keynote speaker, futurist Lisa Bodell, discussed how complexity is our new operating system. The two C-words, complexity and complacency, are hindering innovation, particularly in the legal industry. With the example of a typical day where only 14% of employees’ work is spent doing real work thanks to 45% meetings, 23% spent emailing, and 18% doing unproductive work, the often discussed battle of innovation vs. resistance to change were used to sum up the current state of the traditional legal world. The takeaway: We need more practical methods to create innovation in the legal industry as those who resist are getting left behind. What will the market look like 10 years from now? More and more consolidation, technology training becomes mandatory for new lawyers, and spend on alternative service providers grows exponentially. Increasing Challenges to the Traditional Law Firm Business Model - Law departments are regularly shifting work to non-law firm vendors, and not just ediscovery work. Innovative firms will create partnerships with service providers to ultimately create the best solution for the client. From the End of Lawyers to the Rebirth of Law - Clients sent a clear message to firms pitching business: Don’t bother coming unless you have an innovation team with you. 2. AI is moving into the mainstream. AI as an accepted and mainstream technology among the ILTA crowd seems like a turning point for this topic. At the “Where is AI Making a Big Difference?” session, the primary question among the standing-room-only crowd was: What do we mean by AI in the legal world? For law firms, it signifies a great deal of opportunity. Also of note: Why would law firms want to be more efficient? The resounding answer was because that’s what the clients are demanding. Ultimately, AI frees up lawyers for more high-value work and using technology helps lawyers be better lawyers. As AI becomes widespread, we need, and expect to see, data scientists in the legal industry soon. Governing the AI Revolution - Audience poll: In what capacity are you using AI tools? A large portion of the audience said they are currently using AI for contract review and for document review. Interestingly 0% are using AI tools for governance, while using AI for ediscovery seems to have become mainstream. AI Beyond the Hype - Is AI starting to move beyond hype and closer to widespread adoption in the notoriously slow legal world? People designate something as hype when it fails to solve a problem they have, and innovation when it does. 3. Office 365 is the technology of choice. Office 365 in general was buzzworthy throughout ILTACON18. From a three-part series on everything you need to know about Office 365, to data governance and Office 365 security, to using the new ediscovery features, Office 365 has become the legal world’s technology of choice. 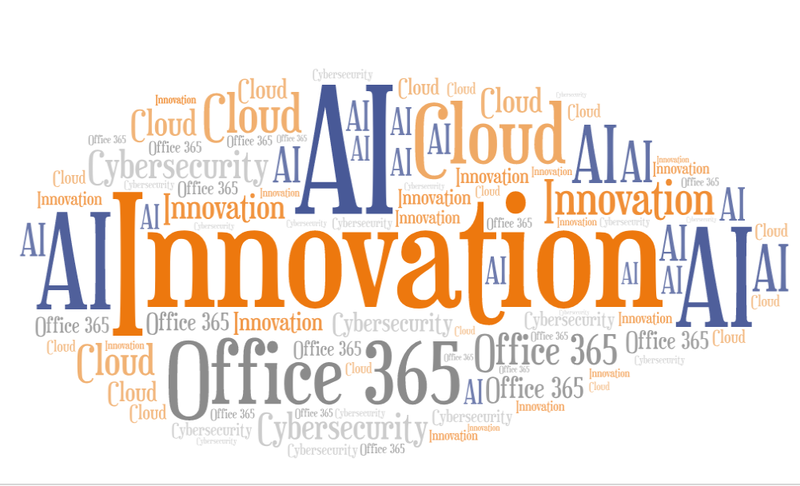 Interest in Office 365 at ILTACON18 was widespread and also covered non-core applications such as Teams, Dynamics, Power BI, and more. The primary buzz around Office 365 revolved around the need for more practical information, such as how to maximize investment, and how to understand and fully implement the wide variety of tools that are available. End-User Experience and Productivity – End-user experience and productivity were top of mind for legal IT professionals in regards to Office 365. With the legal world, and really the whole world, universally embracing Office 365, practical topics such as providing the ideal user experience and utilizing Office 365 to increase productivity were themes heard circulating among attendees. Data Governance and Office 365 Security – The ability to effectively utilize Office 365 to manage data from a security and compliance standpoint was a main interest among attendees, as were best practices for efficiently planning resources to address data governance, compliance issues, and security when initially rolling out Office 365. 4. CLOUD is resoundingly being embraced. The cloud takeover is expected to accelerate rapidly, which is good news for everyone in the legal world seeking to simplify the complexities that have come with the exponential growth of electronic data. Ultimately, the cloud makes a lot of technology available with a lot less friction. Management of the Cloud – As the cloud is being embraced as a secure and cost-effective way to host data off-premises, the legal world has turned its attention away from concerns over security of the cloud, and toward best practices for management of the cloud. At one of the most well-attended cloud sessions, focus was on what to consider when moving to the cloud, particularly proactive strategies on how to stay on top of the continuous updates and patches that come along with maintenance of the cloud. Fully Leveraging the Cloud - For those seeking advice on how to get the legal industry to fully leverage the cloud, recommendations included starting with small, incremental change that’s built on knowing your data, creating a detailed data flow map, and making sure you have dedicated experts available to manage the process. 5. CYBERSECURITY is the number one concern. Attendees across the board named cybersecurity as their number one concern. The most talked about session from ILTACON18 was the session where a fifteen-year-old ethical hacker gave a step-by-step demonstration to the audience on how easy it is to target law firms and attorneys in today’s cybersecurity world, using tools that cost as little as $10. The consensus was that major resources need to be dedicated to security, with modern security operations becoming the normal course of business for all firms. Anatomy of a Data Breach – With high-profile data breaches dominating the news, the legal world is playing a critical role in understanding how to respond to data breaches. With the high possibility that you or your client could be the next victim, now is the time to take proactive steps and create an incident response plan. Cybersecurity and Forensics – Either before or after a breach, forensics is an important tool to navigate and understand the impact of a breach. Overall, I think it’s safe to say this year’s ILTACON showed how innovation and technology have made their way from buzzwords in the legal world to full-fledged movements. It’s exciting to imagine how far we’ll have come by next year’s ILTACON! If you have questions or would like to discuss this topic further, please reach out to me at SLedgerwood@lighthouseglobal.com.